Summary of today’s show: Michael Lavigne has worked in Catholic ministry for two decades, including the last four years leading faith formation efforts for all ages in the Diocese of Portland, Maine. Now he’s come to the Archdiocese of Boston to assist the office of the new Episcopal Vicar for the New Evangelization as we prepare for the Year of Faith. Scot Landry and Fr. Matt Williams talk to Michael about his years in parish ministry with young people, teaching high school theology, and then working at the diocesan level. Also, Jim Wright of the Station of the Cross stops by discuss the latest WQOM news including big updates to their smartphone apps. 1st segment: Scot Landry welcomed everyone to the show and noted today is the Feast of St. James the Greater. Fr. Matt Williams said he is the greater because he was martyred first, because he was present with Jesus at moments that 9 of the apostles wasn’t, because of his authority in Jerusalem; or because he was just taller than the other James. Fr. Matt is very busy this week. Tomorrow begins their middle school leadership retreat called Witness to Hope. Tonight he’s going to be at the Espousal Center for praise and worship, Mass, and a Holy Spirit empowerment primarily for young people. They will pray for a deeper receptivity to the Holy Spirit. It’s geared to all the young people who have gone through the programs of the Office for the New Evangelization of Youth and Young Adults and to receive peer support. They announced it at the Steubenville East conference this past weekend in front of 2,700 young people. Scot noted the Espousal Center is in Waltham. Speaking of Steubenville East, Fr. Matt said it was a phenomenal time with dynamic and gifted speakers. The theme was The Eighth Day, which is the day of the Resurrection. It’s held now at the University of Rhode Island. Monday night is a the high school harbor cruise. There’s still room for participants. Sign up at the Office for the New Evangelization of Youth and Young Adults website. 2nd segment: Scot welcomed Jim Wright, the owner and founder of the Station of the Cross radio network and WQOM. Jim said he’s in town for some business and stopped by. They’re looking for office space for the local studio. Scot said he often hears from people how appreciative they are that Catholic radio came to Boston. Jim thanked all the listeners supporting the Station of the Cross and asked them to continue. The work is intended to bring the people back to the parishes. 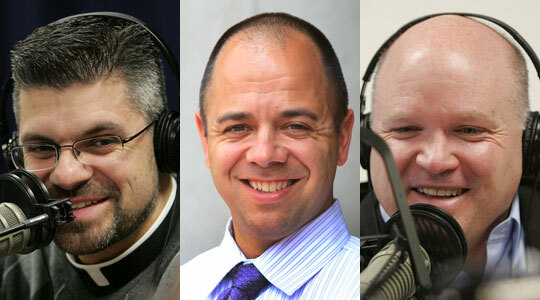 Scot said Jim has been in the Catholic radio ministry for more than a decade. He said Catholic radio grows by listeners recommending it and introducing to others. Jim suggested approaching your family first. Jim said August 15 will make 13 years for the Station of the Cross being on the air. Jim said the same day is also the anniversary for EWTN. Scot said the new iPhone and Android apps are just recently updated with new capabilities. Jim said you can get all of the stations of the network and a Spanish feed as well. It has podcasts as well. They’re planning more features too. To find it in iTunes or an Android marketplace, search for iCatholicFM or iCatholicRadio. Scot said Cardinal Seán would love to see even more content for Spanish-speaking people. Jim asked people to pray for a dedicated Spanish Catholic radio station. 3rd segment: Scot and Fr. Matt welcomed Michael Lavigne to the show. He is senior associate to the episcopal vicar for the New Evangelization. Scot said Michael used to work for the Diocese of Portland, Maine, and they launched three Catholic radio stations there. Michael said the Presence Radio network began a year after the Office of Lifelong Faith Formation was formed. They were overjoyed at being able to collaborate with the radio stations. Scot said Bishop Malone had wanted to raise funds for Catholic radio as a primary effort of the New Evangelization in Maine. Scot asked Michael where he comes from. Michael is originally from Woonsocket, Rhode Island. He married his wife Lori and lived in Providence for four years. They moved to Maine for four years and now moved to Boston. He began working for the Church two decades ago when called by a priest. He was the pastor of his parish when he was a junior in college and active in youth ministry. The pastor asked him to be youth minister and has worked for the Church ever since. At the parish level, Michael moved from the old model of CCD and CYO to a new comprehensive youth ministry vision for the parish. They developed a task force in the parish. They realized that young people were dealing with more and more difficult issues they hadn’t seen prominently before. The task force looked to change things up and ensure that everything was Christocentric, steeped in sacraments and prayer. In the past, everything they did in youth ministry, whether athletics or prayer, had been of equal focus. So they introduced them to Eucharistic adoration which brought them to regular Mass attendance. Michael said the world we live in is so busy and so fast with so much competing for our attention. For some young people, 20 minutes in adoration was an eternity. But once they experienced it, they wanted more of it. The kids said they loved being silent, sitting there letting Christ love them, knowing they were being prayed for. Fr. Matt said for a long time we were afraid to offer the sacraments or adoration because we thought they would be bored and we thought everything had to be fun. It might be because we aped so much of Protestant youth ministry, which doesn’t do the sacraments. Some thought this meant that sacraments wouldn’t interest them. But because of Pope John Paul II and World Youth Days, we learned they wanted to be taught. Many young people, when you teach them, have an epiphany and love what they learn. When you explain and invite, they respond. Michael said he realized early on that they also needed to reach the parents. If the kids went home to parents who extinguished the enthusiasm for the faith, they wouldn’t grow in faith. They used the teens to challenge the parents to grow in faith. They created a clear message starting from the pastor that the parents are always welcome in any youth ministry program. They prepared for everything, including bringing in their kids to register and how they would welcome them and be open to them. Michael told a story of a women who thought she couldn’t register her kids because her husband had left her. Not only did they register the kids, they got her an appointment with the pastor. Michael also taught theology in high school and coordinated confirmation. Michael said in school he had them every single day. At first it was a trial to have enough material to cover and to ensure that he would be real to them, to challenge them. His job was to witness to the Church’s teaching and why it teaches it and then show it in his own life. He said every Catholic who encounters young people has to step up and show we have a relationship with Christ that we are truly living. When they see us, they need to see someone who is proud to be Catholic with their spouse, their kids, their co-workers, their sports teams, etc. He believes he was able to make headway with these young people. After parish work, Michael moved to the Diocese of Portland and led the Office of Lifelong Faith Formation. When his situation at the high school changed, he sent out resumes. When Portland called, there were a series of events that led them to move there. There had been an office for teaching kids and and office for teens and office for young adults and some others, but they felt it was time to make the point that faith formation was for all ages and lifelong. They were strong in youth ministry but weak in formation of adults. They improved marriage preparation and RCIA. They offered something new for parents when they brought their kids for sacraments. First of all, they served the parish leaders and then offer diocesan-wide training for young people and adults to evangelize in their own lives. Scot compared the size of Providence to the size of Boston and the geographical size of Portland, Maine. He asked how they serve such a large area. Michael said it’s always been the obstacle for serving the northernmost parishes. So they used technology, like web conferencing, Skype, high-def TV, websites, email, social media and the like. They found they were able to send a lot more information in a more timely manner. If someone was having a problem in a remote parish, they could talk face-to-face via Skype and make that personal connection. It’s impossible to drive the state of Maine even once per year. They reached as many places as they could. Parishes responded to this.They were able to save money which they used to offer more scholarships and programs. Scot said Portland had a major pastoral planning process over the past five years in which parishes were grouped in clusters to shepherd personnel resources. He asked what they learned there that could help Boston. Michael said he came in after they’d gone through the most difficult parts of the process, like determining parish closings and mergings and the like. When he came in, he was able to say that now they’d done the hard part, it was time for the good stuff. Michael said one of the keys to their work was the catechetical certificate program from the Theological Institute for the New Evangelization at St. John Seminary. They partnered together and had offered it for two years before he left, and the fruit was visible immediately. Parish leaders who’d gone through it said they’d learned more than they ever thought. Some homeschooling parents said they would be more effective teachers of their children. Also catechists, deacons, and others who began to realize that we all need to continue to learn and grow. They also developed the New Evangelization Week. They taught young people the basics of the riches of the prayers of the Church, taught them how to use a Catechism, basics of the faith, how to defend the faith. Bishop Malone called it a Catholic boot camp. They examined what it means to be a son or daughter of God, how to relate to brothers and sisters in the faith–brother to brother and brother-to-sister. All of it was steeped in the Mass every day, Reconciliation, and more. In their second year, a priest came out of Confessions one night to say that the kids who had come the last year were telling him that they had gone to confession within the past week or month. He heard them wrestling with growing as disciples of Jesus Christ. She wins the books Girls’ Night Out: Having Fun with Your Daughter While Raising a Woman of God and A Lamp for My Feet and a Light for My Path (For Catholic Teens). 5th segment: Fr. Matt asked Michael how he went about creating a new system so that when young people are being formed that when they get to the confirmation age, they are more receptive. Michael said in Portland, they have the restored order of the sacraments, in which 2nd graders receive confirmation along with first communion and confession. They have been doing it since 1997. Scot asked the main reason to have confirmation earlier. Michael said the general concept is that they realized they were losing so many young people after confirmation as teens or not even getting confirmed so they weren’t even getting the sacrament. So at an earlier age, more young people receive the grace of the sacrament. They did a 10-year study ending in 2007 and they found it didn’t do anything for retaining kids in grades 3 through 8. So they tackled the 6 through 8 first, bringing the Edge program from Life Teen, jumpstarting middle school youth ministry. In high school, they still had relatively high numbers, but there was still the same question of how to keep people coming to the Church. The answer is about putting witnesses to our faith, passionately in love with the Lord, in front of everyone. When people are in love with the Lord, there is joy. Fr. Matt said where the Holy Spirit is, there is life and joy. Scot said Cardinal Sean appointed Bishop Arthur Kennedy as Episcopal Vicar for the New Evangelization and created this new office to provide more resources for the New Evangelization. Michael said in the next 12 months the focus will be twofold. First, helping the Archdiocese to focus on the Year of Faith, including a celebration to kick it off and compiling recommendations for parishes to mark the Year of Faith. Second, they want to be part of all the conversations connected to Pastoral Planning to ensure that it will really be about conversion and the New Evangelization. We need to give the leaders in the parishes to grow in Christ and in turn help them to bring that to the people in the parishes. Michael said the New Evangelization is ongoing conversion of Catholics to conform our lives to the faith, to have a deeper conversion and strive to holiness. So many of our fellow Catholics have walked away from the faith. There are even people still in our pews who don’t have a relationship with Christ yet. They haven’t had that conversion experience to make it their own. Scot said he got a letter from a weekly Mass-goer that he didn’t really get his faith until he listened to Catholic radio and was led to take his faith more seriously.